Amazon has announced plans to offer buyers of printed books a copy of the text in digital form for free or at a discounted price. Its Matchbook scheme will apply retroactively to any title bought from the store since it opened in 1995. At present the offer is only being publicised on the firm's US website. Analysts agree it is likely to be expanded to others countries but are split over how significant an offer it will prove to be. Amazon said the programme would launch in October and would include more than 10,000 titles. Publishers involved include Harper Collins and Houghton Mifflin Harcourt. The retailer said it was now urging other authors and publishers to enrol. The company launched its Autrorip service, which allows people to get MP3 versions of CDs or records they have bought, in Europe in June, about half a year after the US. One expert said the latest move could overcome some shoppers' concerns about ebooks. "The problem with digital content, as people are just twigging, is that you don't own it, you just license it - you're renting it effectively," said Neill Denny, an independent book industry commentator. "So, to have both a physical copy and an ebook is quite an attractive proposition. And weirdly it might help print, because by bundling the content it locks the analogue to the successful digital model in a way that publishers have been struggling to find." However, Philip Jones, editor of trade publication the Bookseller magazine, was less enthusiastic. "I'm sceptical about whether the reader actually wants it," he told the BBC. "As far as I can tell most people read in one format, so they choose print or they choose digital and it's quite rare that they read both. "However, I can see there would be advantages for students or for people who have particularly weighty hardbacks that they'd like to read in print form at home and then as an e-book on the road." 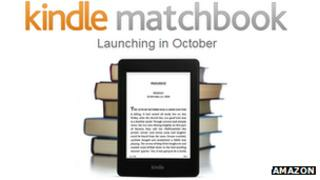 Amazon said that Matchbook would offer digital versions of titles for prices ranging between $2.99 (£1.92) to free. "In addition to being a great new benefit for customers, this is an easy choice for publishers and authors who will now be able to earn more from each book they publish," said Russ Grandinetti, vice president of Kindle Content. The firm has also announced a new version of its bestselling Kindle Paperwhite e-reader, which is being made available outside the US. The company said the latest version would turn pages faster and had a better front-light than the previous model. Amazon's chief executive Jeff Bezos told the BBC last year that his firm made no profit on Kindle hardware. Instead it aims to ensure shoppers come to its site to buy compatible ebooks and other goods from which it does make money. The wi-fi version of the new Paperwhite retains the previous £109 price tag as its predecessor, making it £11 cheaper than Kobo's Aura but still £40 more expensive than Barnes & Noble's Nook Simple Touch Glowlight. According to tech analysis firm Gartner, e-reader sales are expected to fall from 17.9 million units sold worldwide last year to 16.1 million in 2013 because many shoppers are instead preferring to buy tablet computers. However, for those still wanting e-ink based devices, which are easier to read in the sun and offer longer battery life than LCD-based alternatives, Mr Jones suggested Amazon's latest announcements should ensure Kindles continue to dominate the market. "I think the smartest thing here is that they are using their experience as a bookseller of some 15 years heritage across the rest of their business," he said. "They are saying to customers that if you stick with us and buy books from us, eventually in the long-term we will reward you. "I think that's an incredibly powerful message to send out to the consumer even if the practicalities of the Matchbook scheme make it less exciting than you might first think it is."